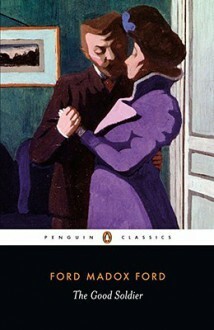 Ford Madox Ford's extraordinary novel of passion and betrayal, "The Good Soldier", is edited with an introduction by David Bradshaw in "Penguin Classics". The Dowells, a wealthy American couple, have been close friends with the Ashburnhams for years. Edward Ashburnham, a first-rate soldier, seems to be the perfect English gentleman, and Leonora his perfect wife, but beneath the surface their marriage seethes with unhappiness and deception. Our only window on the strange tangle of events surrounding Edward is provided by John Dowell, the husband he deceives. Gradually Dowell unfolds a devastating story, in which everyone's honesty is in doubt. "The Good Soldier" is a masterpiece of narrative skill and emotional depth. David Bradshaw's introduction discusses John Dowell as the classic unreliable narrator and as English literature's most fascinating enigma, and shows how Ford Madox Ford's unconventional narrative structure makes "The Good Soldier" a modernist masterwork. Ford Madox Ford (1873-1939), born in Surrey and educated in England, Germany and France, changed his original surname, Hueffer, in 1919, after having served with the British army in World War I. As well as founding both the "English Review" and the "Transatlantic Review", home to such writers as James Joyce, Ezra Pound and Gertrude Stein, Ford was the author of more than sixty works including novels, poems, criticism, travel writing and reminiscences. "The Good Soldier" (1915) is considered his masterpiece. If you enjoyed "The Good Soldier", you might like Ford's "Parade's End", also available in "Penguin Classics", and now the subject of a major new BBC/HBO television miniseries. "A masterpiece". (Julian Barnes, Booker Prize-winning author of "The Sense of an Ending"). "I don't know how many times in nearly forty years I have come back to this novel". (Graham Greene).